The CW’s newest show wants very much to be bleak and edgy. It wants to be seen as breaking boundaries or pushing the envelope. Then its heroine Murphy (Perry Mattfeld) is caught scrunched up, hiding under a coffee table, nearly naked and mortified. The wife of the man she was about to sleep with came home unexpectedly and caught them. Murphy tried to hide, but she didn’t realize the coffee table had a glass top. Because she’s blind. It’s unclear if the slightly icky scene is intended to make you squirm, laugh, or let out a pitying sigh. It’s more likely meant to scream, like almost everything else in the episode does, that Murphy is a mess, but not not because she’s blind. Murphy is a mess in spite of being blind! That’s not to say that Murphy is an awful person. If you can see past her cold interactions with Pretzel and his puppy heart of gold, Murphy is capable of basic humanity. We see this in her honest friendship with Tyson, whom we later learn saved Murphy from an attack. Her better angel also comes out to visit with Dean (Rich Sommer)’s daughter Chloe (Calle Walton) when they visit Guiding Hope. And while Murphy’s scenes with her mom Joy (Kathleen York) suffer from emotional whiplash, her bond with her dad Hank (Derek Webster) is very moving. We learn that she was adopted by Hank and Joy and that when she became blind as a teenager they found their calling running the school for seeing eye dogs. There’s good stuff here that a meaningful story can be mined from. In the Dark also has a central mystery. How did someone like Murphy meet a saint like Jess (Brooke Markham), move in with her, and somehow retain her friendship? The answer is surely wrapped up in the question. I found myself captivated by Jess, in large part due to Markham’s performance. She carries herself like a fully realized character, not one whose story is still being written. Jess even has a mature relationship that we’ll hopefully see much more of. And while just maybe Jess is too gentle with Murphy, she’s also protective and willing to go outside her comfort zone to help her friend. Another person in Murphy’s life, one who gets more real with her, is her parents’ employee Felix (Morgan Krantz). Probably no one treats her more like a regular person. Yet for all his annoyance with Murphy, Felix is still willing to come and rescue her without tattling to her parents. There’s no shortage of of interesting supporting characters. There is an actual mystery. Murphy stumbles into her friend Tyson’s body at their usual meeting spot. No doubt due to her phone not being charged, a major plot point that recurs heavily in the episode, she has to go back to her apartment to call the police. They don’t find a body. We aren’t shown a body either really, as we only see Murphy’s face as she inspects it. Thus we are given no clues. Murphy decides to investigate on her own and starts by confronting Tyson’s cousin Darnell (Keston John). Of course Darnell is too obvious a suspect to actually be the murderer, if it was indeed murder, but contacting him is risky. Murphy eventually proves that Tyson isn’t really at some girl’s house in another state by finding his phone. This mystery should be more compelling. It needs to be. But in this episode the show has only a half-hearted interest in the case, which signals we shouldn't care that much either. 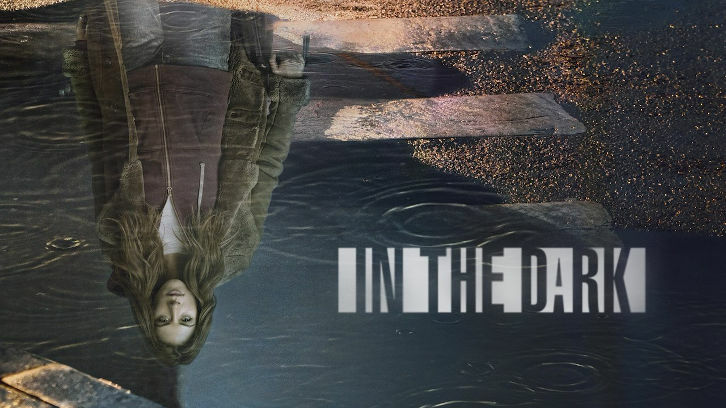 In the Dark’s pilot doesn’t commit to anything. It doesn’t know who it wants its heroine to be. It doesn’t have anything especially unique to say. It under-uses its canine leading man. It can’t be bothered to really care about its own mystery yet. Still, there’s enough talent and emotion hiding in the corners that this show could evolve into something special. I am not confident the show won’t waste it though. Then you go back to that poignant moment with Murphy crying on the bathroom floor, with Pretzel comforting her, and you want this show to reach for its full potential. Time will tell if it does.